When I walked into the supermarket yesterday and noticed they had rhubarb again, I had to buy some. I loved the Roasted Rhubarb Tarts that I made a few weeks ago and I wanted to try out another variation - rhubarb fool. This bunch of rhubarb was thinner and not quite so vibrant as the last lot, but still very tasty. 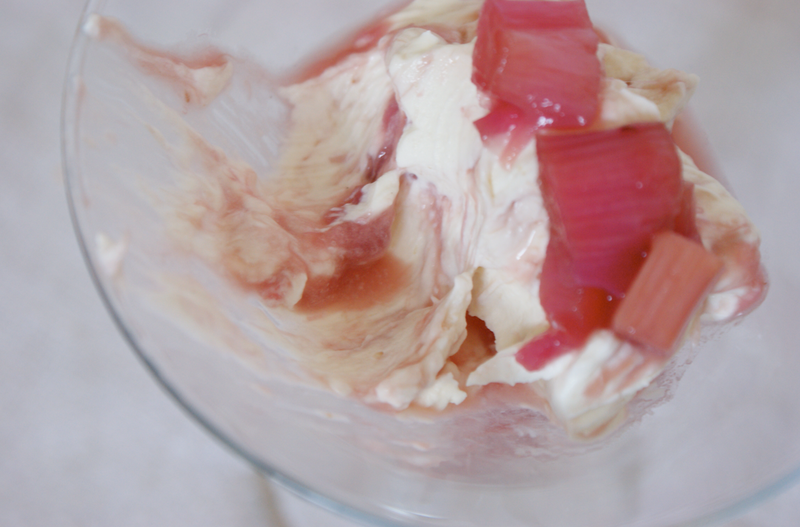 While many recipes call for stewed instead of roasted rhubarb, I couldn't resist making it again. It's so simple and incredibly delicious. I also couldn't resist taking yet more photos of the rhubarb - it's just so pretty! I love the way the pink creeps in from just the outside to all the way through when it's cooked. I had considered folding some custard into the cream but I decided to keep it pure. Just lots of my favourite thick double cream (doppia panna!) - although, scandalously, I have to admit I think a lighter cream would work better in this recipe. It was a little too rich and thick, even when whipped - I would like it to be fluffier, lighter. I've heard rhubarb fool described as like a cloud before. Mine was decadent and truly divine, but I'd like to see how a lighter cream would come out. It seemed like a nice idea to serve my fools with some light biscuits, so I had a look in my Baking Bible and found these. I decided to add some ginger to complement the rhubarb. They came out beautifully - tiny, tasty and crunchy. Dipped in the fool they really brought it all together - the crisp biscuit with the warmth of the ginger against the thick soft cream laced with that beautiful roasted rhubarb. Heat the oven to 190C. 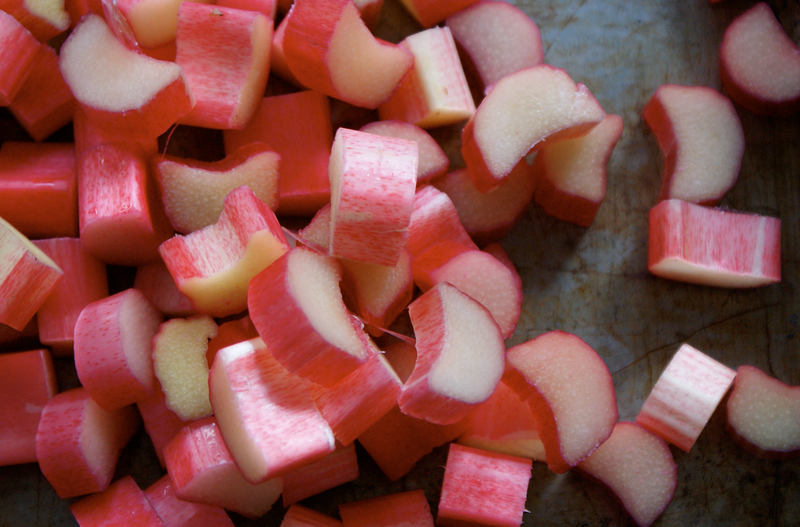 Chop the rhubarb up into small chunks and then put them into a small roasting tray. Toss well in sugar then arrange them in a single layer. Cover the tray with foil and pop in the oven for 10 minutes. Take it out and remove the foil, giving it a shake. Return to the oven for another 5 minutes. Leave to cool. 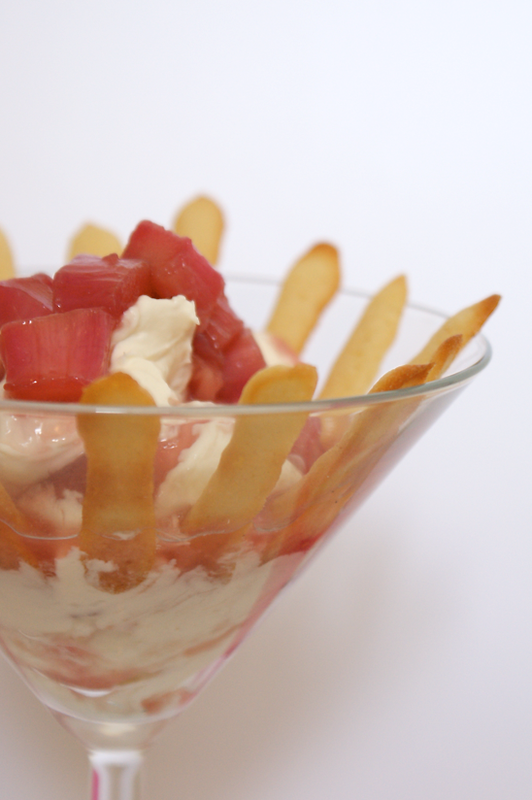 Remove a few tbsps of rhubarb chunks to a plate along with a few tablespoons of syrup. Put the remaining rhubarb into a food processor and blend. Whip until holding soft peaks. 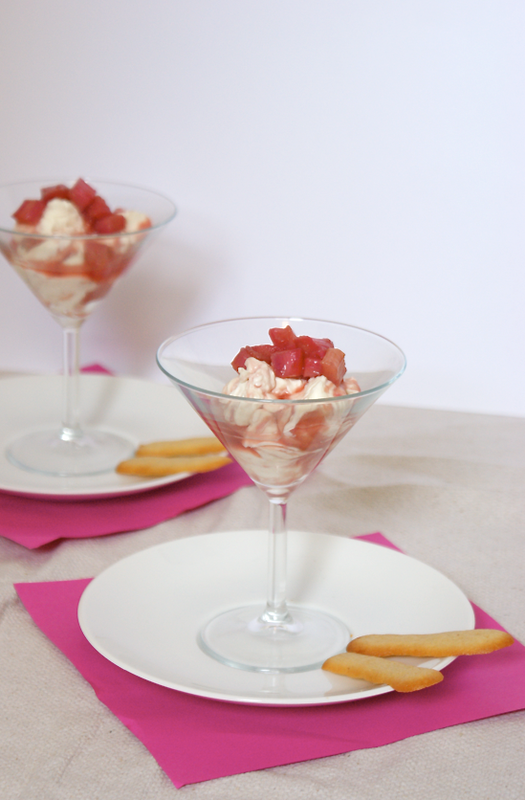 Scrape the pureed rhubarb into the cream bowl and fold three times to give a marbled effect. Spoon into your desired serving vessel. 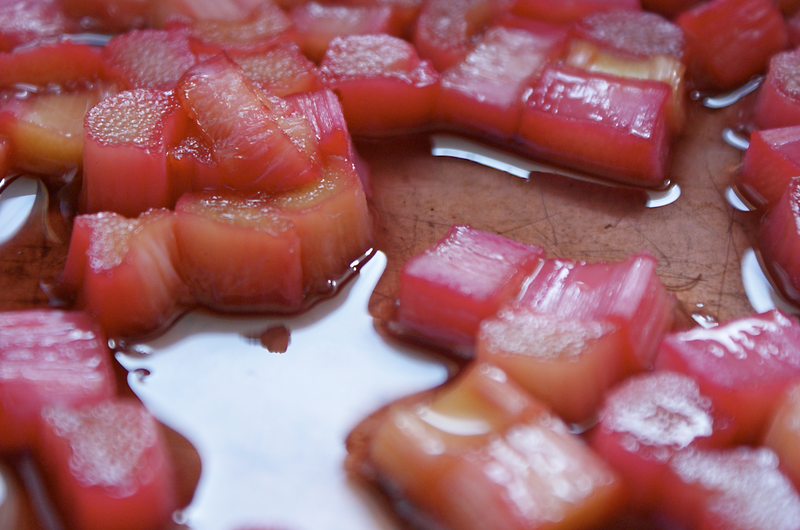 Top with chunks of rhubarb and some of the syrup. Now try not to drop them! Preheat the oven to 200C/400F. Line baking sheets with parchment. Cream the butter and sugar until light and fluffy, then start to beat in the eggs a small amount at a time, beating well in between each addition. Sift the flour and ground ginger over the top and fold in. Put the mixing into a piping bag (I used a 0.5 cm plain nozzle as directed, but I will use a slightly bigger one another time). Pipe fingers onto the parchment , leaving plenty of space for spreading. Tap to release bubbles. 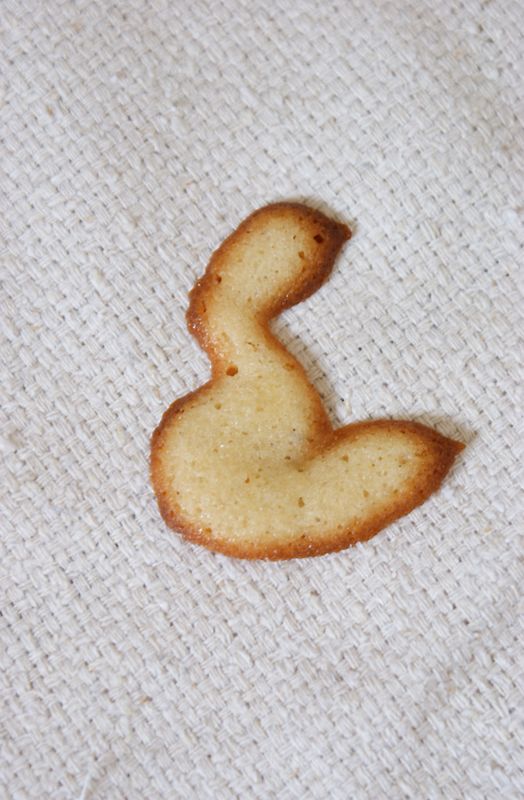 Bake for 5-7 minutes until pale gold in the centre and browned at the edges. Leave on the sheet for a few minutes before moving to a wire rack to fully cool. Makes 30 - 40 or so. 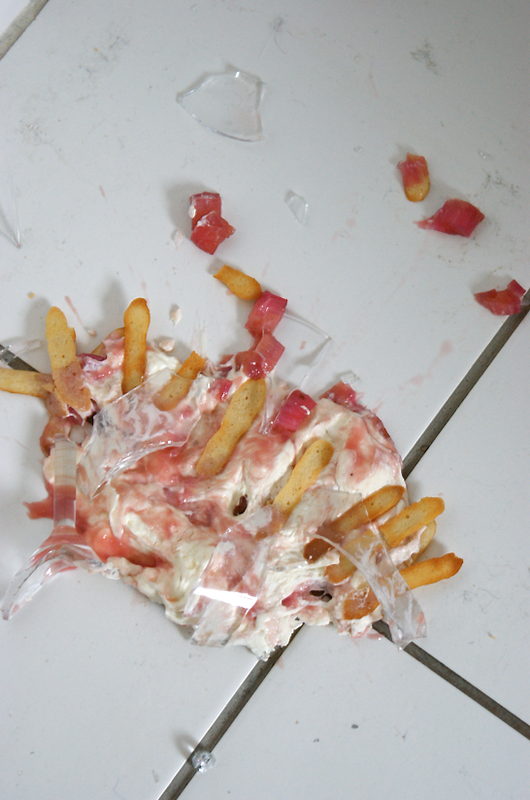 Oh, I am so sorry that your plate fell. What a mess and waste. We looove Rhubarb. Your dessert looks yummy. I remember "Katzenzungen". You can by those in Germany, but have never found them here in the U.S.. Thanks for your recipe. What a shame about the second dish - still at least you got to sample some of dessert. It sounds so zingy my mouth is watering from the thought of the rhubarb and ginger. This sounds wonderful! I wanted to make something with rhubarb at Easter, but the rhubarb had just broken through the ground in my mother's garden. I have to wait another month... Ginger is such a nice flavour with rhubarb--bet it was delicious!